Intro: Welcome to ‘The Florida Bar Podcast’, where we highlight the latest trends in law office and law practice management to help you run your law firm, brought to you by the Florida Bar’s Practice Resource Institute. You are listening to Legal Talk Network. 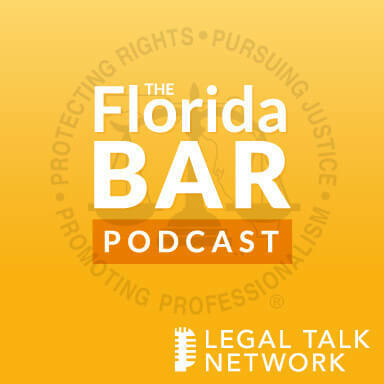 Christine Bilbrey: Hello and welcome to ‘The Florida Bar Podcast’, brought to you by the Practice Resource Institute on Legal Talk Network. We are so glad you are joining us. This is Christine Bilbrey and I am a Practice Management Advisor at PRI and one of the hosts for today’s show, which is being recorded from our offices in Tallahassee, Florida. My co-host is Jonathon Israel. Jonathon Israel: Hello, I am Jonathon Israel and I am the Director of The Florida Bar’s Practice Resource Institute. Our goal at PRI is to assist Florida attorneys with running the business side of their law practices. We will be focusing on a different aspect of technology each month and will carry that theme through our newsletter, website, and with related tech tips and articles. Christine Bilbrey: So this month at PRI, our topic is “Small Firm Business Processes”, and joining us today is Rick Georges. Rick is a solo practitioner practicing in St. Petersburg, Florida and he’s best known as the Future Lawyer. In his column and on his website, he writes about the new technologies changing the practice of law. He’s also a poet, author, professor, seminar presenter and a past chair of the Florida Bar Technology Committee. Welcome to the show, Rick. Rick Georges: Thanks. Welcome to everybody. Christine Bilbrey: So, Rick, tell our listeners a little bit about yourself and your role as the Future Lawyer? Rick Georges: Okay, I got the Future Lawyer many years ago when I first started my website way back before most of you were born in 1994 and I had just seen a movie called ‘Future Cop’ and I was looking for a name for my website and I thought about the fact that I had always been interested in using technology to simplify and make cheaper and more efficient practice of law. So I said, why not Future Lawyer, and my editor agreed and it went from there. I’ve been practicing solo since 1985, I have been practicing law since 1973, I’m a very old man but I have a young mind and a face and body made for radio, so thank God, this isn’t on television. I use technology every single day. Now, that I am — I guess, you’d call me semi-retired since I have passed retirement age to avoid overhead, to avoid employees, to avoid having people all around me all the time that I have to pay salaries to, and I also want to do it cheaply if possible. I think most lawyers don’t realize that they do not have to spend thousands of thousands of dollars on equipment and people and processes, these days, the days of the Internet and hopefully we can talk a little bit about today some of the things that they can do that are either free or cheap, call it practicing law in $5 a day. Christine Bilbrey: You should write that book, yes. Rick Georges: I was thinking about it, but then again, I’m old and tired. Jonathon Israel: Yeah, that’s great, Rick. Well, if you don’t do it I’m sure one of our listeners may jump on that for us, after you hear what you have to say. So, Rick, on that note, obviously being a solo practitioner you don’t have anybody to delegate some of these back-end administrative tasks to. So what is one tool that you could tell our listeners right now that you could not live without that they should go out and pick up, even if it does cost a little bit, a tool that they could go right now and implement and helping improve or take the load off of some of these back-end administrative tasks that they are having to do and take up all their time? Rick Georges: There are a bunch of them. I mean, I could go on forever. If I had to think of one right off the top of my head, it’s Internet banking and Internet accounting. There is no reason why every lawyer should not have Quicken or QuickBooks on their computer connected or linked to their bank. In effect, I have control over my bank accounts and the typical lawyer has several, I mean, if he does probate law, he’s got estates that he has to keep track of. Obviously, if you’re a real estate lawyer these days, you have to have both a real estate trust account and a general trust account. You have trust accounting guidelines, you have general accounts, you’ve got – listen, I must have seven or eight, ten bank accounts at any given time that I have to keep track of, but with the Internet and with any web browser, I use Chrome from Google, but you can use any one, all the banks now have very secure websites that enable you with the use of accounting program. I use Quicken, you can use QuickBooks, if you want to go or more, and I basically, every morning the first thing I do is I link up with the bank and I know exactly what my financial picture is. So gone are the days in the old days when we had to write checks manually or we had to hire a secretary to write checks and mail them out. We can pay our bills online, we can buy things online, we can keep track of our bank accounts online, that probably is the one thing that I use every day. Although, there are a lot of them, I mean I could go on and on. Gmail — free Gmail if you use two-factor authentication on Google, it’s just as safe as anything you could do, and we can talk more about what two-factor authentication is later if you want to, but it is secure. Use Google Calendar, it’s free, you don’t have to buy a calendaring system, although if you have an active litigation practice you should probably buy a case management program. Those are only 45 or 50 bucks a month for user now for the online versions. Your legal research is free, I mean, the Florida Bar provides access to legal research on past case which is for board or off-board, the cases everywhere. In the old days we had to go a little odd, we had to go through an index, we had to sit down for hours at a table opening and reading books in cases, and nowadays it’s right there at your fingertips as part of your bargains. Google Scholar gives you access to case law throughout the United States. You can actually do a research project nowadays that will give you cases from any jurisdiction and it’s all free. Google provides it for free, I mean, I can go on and on. Christine Bilbrey: Yeah, and these were excellent examples. Well, I want to break it down because you made some good points. So I want to kind of unpack that. Every month I get calls from young attorneys that say are we allowed to have access to our bank accounts online, and they think that it’s something that’s not secure and I want to stress that they’re not allowed to have an ATM debit card attached to their trust account, but I absolutely encourage all of them, and I’m glad you said, you know where you’re at every day. Christine Bilbrey: It’s a lot harder for you to get in trouble with your trust account, if you are checking that on every day. I encourage them to have online access with that and you made a good point since you can pay your bills online, you’ve gotten rid of the security issue of having someone in your office they could take your checks and be writing trust checks all over town. So it’s actually more secure than the old-fashioned way of doing it. Rick Georges: No question about it and not only are all bank sites but many sites now secure. All you have to do is look at your URL line and if you see that HTTPS, the S on the end, you know that that site is secure. Now, is anything a 100% secure? Absolutely not, but it’s far more secure than having paper checks, sitting in a filing cabinet in your office and many attorneys are not aware that if they have that kind of financial record in their office it’s supposed to be under lock and key when they leave the office. For real estate purposes, you’re far more secure nowadays with online banking because number one, wired funds are going to be able to be used in your closing a lot faster than depositing a check at the bank. Once the wired funds are in, payments that can be made electronically are a lot safer than writing out manual checks, put them in the mail and waiting to see if they get received or lost. There are just a hundred different ways that online banking and online computing is more secure. Now, on that score though I stress that if you’re going to use online resources like Gmail or Google Calendar or any one of a number of other services, two-factor authentication is essential, and by that I mean many secure websites now will provide you with the opportunity. When you sign into the website, they send you a passcode on a device that you have in your possession, it could be a cellphone, it could be whatever, but once you have that code then you manually enter it into the system, you know that somebody else won’t be able to get into your Google account because they don’t have your cellphone. So I would not do anything without two-factor authentication that deals with confidential client matters or confidential client data or financial information. Jonathon Israel: Those are great points, Rick. I can’t agree more. I mean, it’s — the fears of moving to the cloud are really going away quickly with the security that is being built into these applications and the platforms that are out there. Rick Georges: There are all sorts of things you can do online now that you couldn’t before. I had a closing this morning where the closing document is going to be overnighted to me. Tomorrow I have to record. While in the old days, sometimes you would mail the deed, mail the mortgage into the recording office, you wait a week or two to find out if they got it and they actually recorded it or in most cases, you would have to actually get your car, drive down to the courthouse and the documents to the clerk while you are waiting in line. Now, using something like Simplifile, for $4.50, all you have to do is send a copy of the documents, scan it, and send it to the Simplifile people. They send it to the clerk and the clerk records it. You get it back that afternoon with the recording information and you are done. So many things, and again, people have always told me, well, isn’t using the Internet insecure, can’t somebody get at your data? Well, yeah, but it’s a lot more secure than having all of your security documents and all your confidential information in a locked filing cabinet in your office, and all it takes is one burglar to break the lock on your front door and come in and break the lock on your filing cabinet and they have got access to all your documents. This is the same argument I had 20 years ago when I was talking of email. I was at a Bar function and I said, every lawyer should have an email account, and half of them wanted to know, well, what’s email? And once I explained what email was, they said, well, you mean you type this stuff and you send it out into the Internet? I mean, isn’t that insecure? I said, well, let me ask you this, is it more secure to write confidential client information on a piece of paper, put it in an envelope that is secured by the licking of the envelope, hand the envelope to a postal clerk, and then wait and see and hope that the envelope gets to the people that it’s supposed to go to without anybody opening it? I mean please. Jonathon Israel: With the word confidential stamped on it. Christine Bilbrey: The magic stamp of confidential. Rick Georges: Sometimes putting confidential stamp on it is like putting a red flag in front of a bull. I mean, that’s just an invitation to somebody to open it up. So again, electronic is better. Electronic isn’t perfect. Obviously there have been hacks, obviously hacks are possible, but the Bar only requires that you do what is confidential. Take reasonable precautions within the state-of-the-art to keep the information confidential. You are not required to be the 100% guarantor of security for the rest of your career. That’s just not feasible. But again, if you take reasonable security precautions, the Internet and computers are safe as you can be. Jonathon Israel: Have you made the move to being completely cloud-based? Rick Georges: I am, except since I am a solo and I am semi-retired, I still do my client billing and my client documents on my computer, that I keep with me at all times, although I do email documents securely. I use PDF/A so the documents can’t be modified, and when I e-file things, you have to use PDF/A, so that they can’t be modified, and I make sure that I verify that they got to the clerk in the form that I sent them. So the answer is I scan everything, so I am largely paper-free except I keep paper, even after I scan it as a backup. But yeah, I have largely gone to an electronic practice. But as I said, I do email, calendaring, legal research, public records access, e-recording, online banking, online trust accounting. I publicize the practice through my blog and social media, which is whole another discussion about how to advertise for free or cheap. You develop an online persona and you will get much, much faster and broader recognition than you would ever get with the yellow pages ad or a newspaper ad. Christine Bilbrey: Have you experimented with any of the electronics signing software programs yet? Rick Georges: I did, yeah, I looked at DocuSign, and the problem that I saw with those is most of them require a larger monthly minimum than I as a solo were prepared to pay. I just don’t have that much. Although, if you take a look at your typical real estate broker now, they are all using it, because they do a whole lot of online signing. I don’t have a problem with online signing, given the legal ramifications of client counseling however, I am a lot more comfortable with a face-to-face with a client discussing a document that they are going to sign than I am emailing it to them and expecting them to re-sign and know what questions to ask me. So, I am not all there on document signing on the Internet, although in the proper circumstances, sure, why not. Christine Bilbrey: And you make a good point there that so many of these things add a lot of convenience for an attorney, but you don’t want to lose the personal touch of actually being there and guiding your client. So I am glad that you bring that up. Rick Georges: Yeah. It’s not just that, if you are not counseling your client face-to-face or person to person, then you risk not only losing that personal touch, but you also risk losing the client or having an unhappy client saying, why didn’t you tell me this, why didn’t you tell me that, why didn’t you tell me that if I sign this thing that this would happen? So I try never to — I mean, I discuss these things by secure email with clients, and I will discuss them in detail and I will give them a long email with a point-by-point analysis of a particular document, and then I answer their questions by email, but I never, ever, ever allow them to sign something without having a phone conversation or a face-to-face conversation discussing the document before they sign it. Christine Bilbrey: That’s good. Which program are you using to make sure that your email is secure, are you using an encrypted program or is it just one of the Gmail, the higher level Gmail account? Rick Georges: No, I use the straight Gmail, but for encryption stuff I use ProtonMail, which is encrypted from computer to computer and back. Did you hear that? Rick Georges: I taught my Alexa device to respond to the phrase computer, and when I just used that phrase, it woke up. See, sometimes computer — oh, there I did it again, they do things that we don’t expect them to do. But there are certain communications that you absolutely want to keep confidential and those I use encrypted email. And there are a bunch of them out there. They are easy to find. And the ProtonMail is free. Rick Georges: It’s a separate program. Yeah, that’s another thing too, as far as mobile devices. Mobile devices are really dangerous places to keep confidential data, but the mobile devices that we use sometimes can be hacked, and as we have seen in the news, if somebody gets possession of them, they can be gotten into. So the first thing I tell lawyers about the mobile devices like phones is make sure the phone is encrypted, make sure that access to it is done by an actual code, a number code, or series of numbers that have to be manually inputted. Do not ever use the fingerprint scanner, and everybody says that’s so secure. Well, the problem with that is, is that you can be forced to give up your fingerprint, it’s a physical attribute, and you cannot be forced to say something that’s in your mind that might tend to incriminate you, not that you would do anything criminal. But you have got to be very careful about keeping all the contents of the phone encrypted. You have to be very careful about blocking access to the phone. And again, everything you use should be two-factor authenticated. Christine Bilbrey: And the two-factor authentication is a big deal. I mean, we have seen that just with banks, but attorneys need to get more in touch with that. And I also like the point that you are making about the fingerprint thing. That’s come up more and more, and when you realize that your fingerprints are all over your phone, someone who knows what they are doing, you have already given them the passcode for your phone, so I in fact just turned that off yesterday. Rick Georges: That’s exactly accurate. I had not thought of that issue. I have thought of the issue of you can be forced to give up anything that is a physical attribute by an authority and you may not want to do that, especially if you have got confidential information. Now, you can always claim privilege, but that’s not going to stop them from going in. And most of the stuff that you have on your phone is just as privileged as the things that you have in your files. And most attorneys, I have this problem with all of my Facebook friends, my family and my friends, they are always getting hacked, and I say, there is no excuse to be hacked on Facebook, there is just no excuse, because all you have to do is turn on two-factor authentication and all of these people from all of these countries that try to break into your Facebook system don’t have your phone, so they aren’t going to be able to hack you. But you talk till you are blue in the face and three or four times a year I will write a post on security and I will just say there are some simple things that you can do that will stop 99% of these intrusions. But people just don’t want to be inconvenienced, and it’s inconvenient to have to go look for a two-factor code. It takes more time. You have to remember a password. And that’s another thing, you should never memorize passwords, you should use complicated passwords. You don’t use your birthday. You don’t use your mom’s maiden name. The password should contain uppercase characters, lowercase characters, both numbers and alphanumerics, and it should be something that you are able to remember but you shouldn’t have to. I believe in password managers. That’s another good thing you can do. But we can talk about security for about five hours also. All the stuff I have discussed by the way is free. There are some paid apps that I use everyday. I am a real property lawyer primarily, so I use a West product called ProDoc. ProDoc is available in Texas, Florida and California. And it is basically a document assembly program that has all of the forms that you need in various areas of the law, and what you do is you answer expert questions and they create a basic document for you to use as a base. That really can speed up for a solo or a small firm practitioner the creation of very complex documents. So that costs between $125 and $500 a month, depending on what you subscribe to, but that’s a very good program. Christine Bilbrey: I love ProDoc. I think that even for solos or brand-new attorneys, I think that they are scared off by the price, but depending on what area of law you practice in, it’s amazingly affordable when you look at what you would have to pay a full-time paralegal and it gets rid of so many errors. People that are still relying on a form bank, yeah. Rick Georges: One transactional paper. Rick Georges: Wills and trust drafting. I mean, a lot of that is boilerplate and you can spend a whole lot more time counseling the client and finding out what their needs are if you don’t have to sit down and laboriously draft a whole lot of documents that contain errors. Now, all that said, there’s such a thing called the computer malpractice. Once very early in my career, maybe 30 years ago, before computers, I had drafted a will, and I was using automatic typewriters then, and because of the addition of one word, I forget what it was, no or not or something, I totally reversed the meaning of the document. And I went ahead and filed the will, filed for probate, and come to find out that the will said something totally opposite of what my client had wanted. So that took me about six months to fix, and it taught me a very important lesson, no matter what kind of a document your computer creates or your document automation software creates, it is absolutely essential that you read every single word and think about every single word in the document, no matter how long it is, and that you don’t use it as a substitute for your legal judgment. Because if you do, sometimes computers will spit out things that you do not want them to say, and I call that computer malpractice, but again, you have got to be very careful when you use these tools that you don’t let them substitute for your own judgment. Christine Bilbrey: That’s a good point, the overreliance on the on the technology can get you in trouble. Rick Georges: Yeah. Oh, and while I am on the subject, best resource is free, well, technically it’s free, you pay for it with your dues, the Florida Practice Resource Institute. You have more stuff online at the Florida Bar website than most lawyers know exist, but they don’t use it, they don’t go there. So I am always telling lawyers, go to PRI site and look at what they have. They have source materials, they have forms, they have all sorts of recommendations about technology and the law, and if you are not using that, you are wasting your Bar dues. Christine Bilbrey: We appreciate that plug. Jonathon Israel: Very much. And on a similar note to that Rick, a lot of the technologies and things that you listed today, like the ProDoc and the Fastcase, we just want to reiterate that those are available as a benefit to our members through our Member Benefits Program. So go out there and research, it’s available to you. Rick Georges: Hey, when I was going to law school in 1970, we would spend hours in the library going through index cards and card catalogues, learning the Dewey decimal system, going through thousands and thousands of books, pulling down the books, shepardizing manually and looking for cases in books, and these young lawyers today they have no concept of how good they have got it, and they have no concept of how easy it is to do legal research today because they never had to do it the hard way. That’s another reason why I believe it’s kind of like teaching a kid to add and subtract and not making them do it on paper and pencil, giving them a calculator. There is something to be learned by doing things manually before you jump into allowing a computer to do it for you. I think we need to do more of that. But again, that’s just an old man talking about old things. Christine Bilbrey: What’s one of your favorite high-tech gadgets, I know that you are a gadget guy, what’s something that you are using, I know that you — we heard your Alexa talking to you, but what else do you really love right now? Rick Georges: It depends on which one I have bought lately; I am buying them all the time. I explained to my wife that it’s better I am spending money on that and some other things that we could talk about. My most recent purchase was Saturday actually. I have a collection of smartwatches, and I have been intrigued by them since they first came out a couple of years ago, and I pretty much bought one of every smartwatch that has become available. And until recently I was using the Samsung Gear S3 Frontier, because it had a phone chip in it, but it uses the Tizen OS, which is pretty much an orphan OS that Samsung uses. Whereas, most modern smartwatches now in the Android area, where I am, are Android Wear. Well, the new version of Android Wear 2.0 just came out on Saturday and I bought the LG Watch Sport, which contains everything you could ever want in a smartwatch. It actually is a smartwatch phone. It has a phone chip, it has got GPS sensors, it has got an NFC chip, so you can use Android Pay with it. It is fast. The battery lasts two days. It’s got a great big beautiful screen. And the thing I like most is that it operates independently as a cellphone. So you program it with your phone, but if you leave your phone, like I do in the cradle all day, I can hop in the car and I still get all my texts, my emails, I can make phone calls, I can do pretty much anything with the watch that you can do with a smartphone. So that’s my favorite gadget. Christine Bilbrey: And you can leave your phone behind, I didn’t know that that was the thing already, that’s great. Rick Georges: Yeah. See, a lot of people kept telling me, well, why does a smartwatch need a phone chip? Well, it needs a phone chip because with a phone chip it acts like a smartphone. It has access to all of the same things that a smartphone does. So if it has its own phone chip, you can still link to the phone if you have the phone. But Android Wear 2.0 now is a standalone. It has its own apps. You can download apps on the watch. With the phone chip, it can do anything that the phone can do, and that brings me to another thing you can do for free, and that’s get a Google Voice number. I have had one for several years. My office phone is really kind of extraneous right now, although I have kept it, but any call to my office phone is automatically forwarded to my Google Voice number, which is a lifetime free number that Google gives you for free. That number then you can forward to any number of phones or devices. So I forward my Google Voice number to all of my smartwatches and all of my smartphones simultaneously. So whenever somebody calls me on the office, whatever device I happen to have handy, I can take the call on. So the fact that these smartwatches have phone chips in them, that they are phone-enabled means that I can actually practice law on my wrist if I don’t have my phone handy. Some people say you don’t need a phone chip in your watch, I say it’s essential, especially if you want to be in touch wherever you are. As a matter of fact, this is what I have been looking for, for the past 25 years and that is the ability to practice law, with just me, walking around with this little watch on my wrist, I literally can take calls, emails, texts. I can do legal research. I can use the GPS to find my way to the courthouse. I can do whatever I need to do. Admittedly, it’s tougher on a small screen, but the point is that the technology is there if you need it. Christine Bilbrey: I love that. I didn’t know about that watch. Now I am going to have to go out and get one. Jonathon wears his Apple Watch, but yours sounds cooler now. Jonathon Israel: Way cooler, I am a little jealous. Rick Georges: Apple is brain dead. Apple doesn’t even have a watch with a phone chip in it. Jonathon Israel: Sacrilege over there. Christine Bilbrey: Oh, oh, these are fighting words. Rick Georges: I bought one for my son for Christmas and it really — I couldn’t stand it. I was paying $200 more for the damn thing than its worth and it doesn’t even have a phone chip in it. I told my son, I said, what is it about this Apple Watch? And I guess, I don’t know, millennials seem to like Apple for some reason. Christine Bilbrey: Well, you have given us so many good tips today and we are going to list those on our website, but it looks like we have come to the end of our program and I want to thank Rick Georges for joining us today. Rick Georges: Thank you for having me. Christine Bilbrey: So if our listeners have questions or wish to follow up with you, how can they reach you? Rick Georges: Good question. Go to HYPERLINK “http://www.futurelawyer.com” futurelawyer.com and there’s a search box there, so anything I have written about in the last 15 or 20 years, which is just about anything technology-oriented that a lawyer might be interested in, just type in the search term, it’s like searching Google and you will find all of my posts. You can phone me, email me, you can go to Google+, you can go to Twitter, you can go anywhere and ask a question and I will answer it for free. I have been doing that for lawyers for a long, long time, and I am happy to do it for any member of the Bar or anybody that really listens to these podcasts. The problem I see is getting these podcasts to the people that need it and they are the ones that aren’t using it. So same thing with Danny Aller and the social media of The Florida Bar, I would like to put a plug in for him, at The Florida Bar, @theflabar, Danny Aller runs that Social Media Department for The Florida Bar. That’s the best way to keep in touch with what’s going on at the Bar, because he writes about it every single day. You can reach me on Google+, @rickgeorges. You can reach me on Facebook, futurelawyerrickgeorges at Facebook, and you can email me at HYPERLINK “mailto:[email protected]” [email protected] or HYPERLINK “mailto:[email protected]” [email protected]. Christine Bilbrey: Great. Thank you. So this has been another edition of The Florida Bar Podcast brought to you by the Practice Research Institute on Legal Talk Network. I am Christine Bilbrey. Jonathon Israel: And I am Jonathon Israel. Until next time, thanks for listening. If you would like more information about today’s show, please visit HYPERLINK “http://www.legaltalknetwork.com/”legaltalknetwork.com. Subscribe via iTunes and RSS. Find The Florida Bar, the Florida Bar Practice Research Institute and Legal Talk Network on Twitter, Facebook and LinkedIn, or download the free app from Legal Talk Network in Google Play and iTunes.